Getting criticism is part of the deal we made when we accepted that first speaking engagement, or magazine article. If you put yourself out there publicly, you’ll get some nice responses, and conversely, not so nice responses. The New York Times had asked Noreen to respond to a question, and obviously somebody didn’t like her answer. I’d love to say we were hurt and upset when this anonymous note showed up. Noreen was in New York, and the rest of the studio thought it was hilarious. 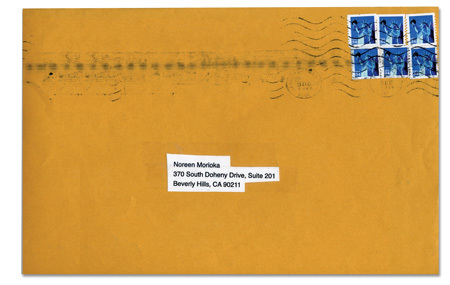 Trying to solve the mystery of who sent the note became an ongoing project. Note the clues: the old How magazine logo, but I’m pretty sure Bryn Mooth at How didn’t send it; she’s actually one of those people who is good to the core. The consensus was that it came from a woman-owned company due to type from Cosmopolitan magazine, and the Hollywood postmark limited the attacker to Southern California, or a tourist at Grauman’s Chinese Theater. Unfortunately we never solved the mystery. We hid the note in a drawer so Noreen wouldn’t see it. I wanted to wait until she was having a really bad day to show it to her. I’m that nice. 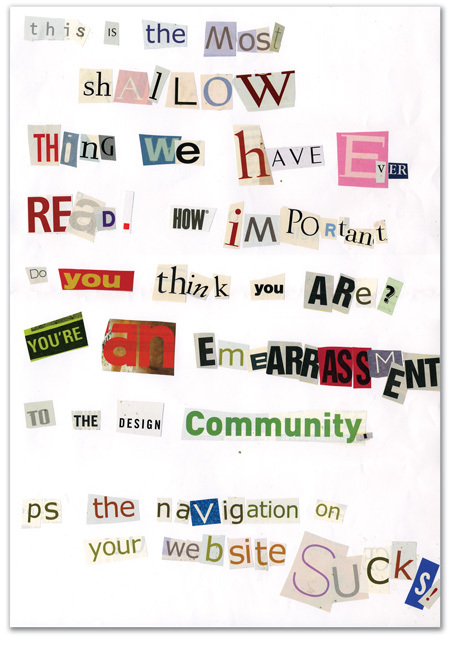 The upside was that I didn’t like our website’s navigation, and now I had validation in the form of hate mail even though it used pretty expected typography.